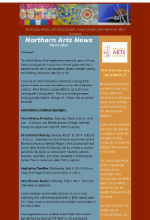 April Northern Arts News: Read it Today! 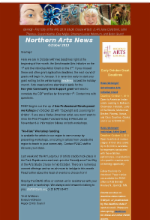 The April edition of Northern Arts News provides readers with updated information on arts events, artist opportunities, and noteworthy achievements of our Region 2 artists. Read Northern Arts News today! Artist Mentor grant writing workshop: 3/8, 10-12 p.m. Artist Mentor info session: 3/10, 6:30-8:30 p.m.
and so much more! Read Northern Arts News today! 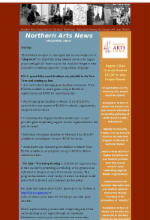 Read Northern Arts News and stay informed! …and so much more! Read. Do. Subscribe! 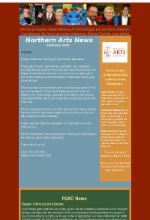 January 2014 Northern Arts News: Start the New Year Off with Art! December Northern Arts News: Don’t Miss Out! But wait! There’s so much more! Click here for dates and more info about other great arts events and opportunities. 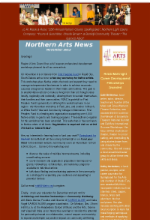 Northern Arts News is Hot Off the Press! Don’t miss out. 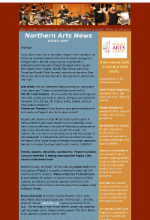 Read Northern Arts News!